The large-scale movements of refugees and economic migrants from conflict zones to more stable societies have resulted in challenges, both for new entrants and their hosts. 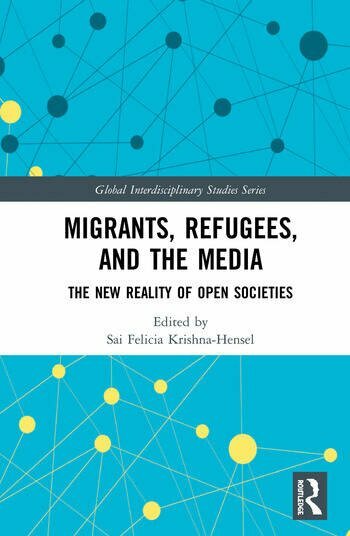 This fascinating volume brings together a collection of media analyses focused on immigration issues to examine how migration has been represented to the public. Case studies exploring media coverage of migrants and refugees in Europe enable the reader to better understand the complexity of the process through a range of unique and unexplored dimensions of immigration analysis, including strategic framing theory, game structure analysis, migration maps and routes, television narratives, rumour-based communication, and state-bred campaigns. The insights into the perspective of migrants, the general public and policy makers provide innovative methodological and theoretical analysis on population movements which will be of interest to scholars, students, and policy makers working in the fields of migration studies, international relations, peace and security studies, and social and public policy. Sai Felicia Krishna-Hensel is Director of the Global Cooperative Initiative, an academic, diplomatic, and policy forum. She has served as Director of the Interdisciplinary Global Studies Research Initiative at Auburn University Montgomery. She was President and Program Chair of the Comparative Interdisciplinary Studies Section of the International Studies Association from 1988 to 2015. She was honoured with the Millennium Distinguished Service and Scholar Award in 2007. She has been a Fulbright Faculty Fellow, was inducted into the Lychnos Society, and was elected a Life Fellow of the Royal Geographic Society for her contributions to the study of colonial urbanization. She is widely published in the fields of urbanization and globalization. She is editor of the Global Interdisciplinary Series for Routledge and has edited several volumes, including The New Millennium: Challenges and Strategies for a Globalizing World, Global Cooperation, The New Security Frontiers, Power and Security in the Information Age, and Religion, Education, and Governance in the Middle East, among others. She has taught at the Universities of Delhi and Virginia. She has actively promoted interdisciplinary discourse and scholarship through the Millennium Series of Conferences and several other outreach initiatives.